RAMALLAH (Ma’an) — The head of the Palestinian Authority committee against the separation wall and settlements died Wednesday after Israeli soldiers assaulted him in a village near Ramallah, committee sources said. He lost consciousness and was taken to Ramallah Public Hospital where he was later pronounced dead. Medical sources told Ma’an that Abu Ein lost consciousness and that his heart stopped after being beaten by Israeli soldiers and inhaling tear gas. “The Coordinator of Government Activities in the Territories, Maj. Gen. Yoav (Poli) Mordechai, and his Palestinian counterpart, Hussein Al-Sheikh, have agreed that an Israeli pathologist will join a delegation of pathologists from Jordan, for a joint examination of the circumstances of Ziad Abu Ein’s death. 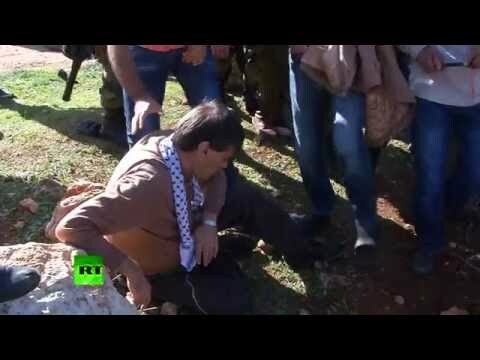 A Ma’an reporter said Abu Ein was taking part in a tree-planting project in an area of the village threatened with confiscation.